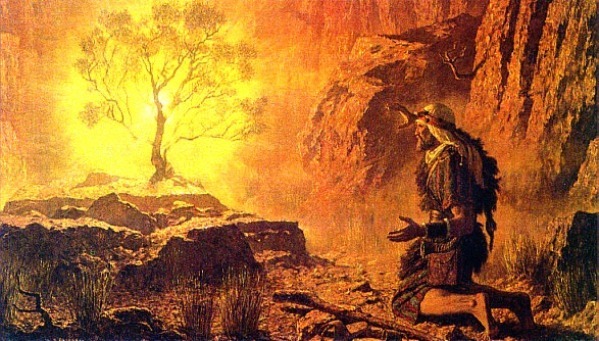 When Moses saw the Burning bush, he was amazed and said” I will now turn aside and see this great sight, why the bush does not burn” ( Exodus 3:3). Moses testified on the greatness of the scene. The question here is what is the secret of such greatness?! It is the mystery of Incarnation, when the Holy Spirit came upon saint Mary, and The Power of The Highest overshadowed her without burning her, fulfilling the Word of The Book” Great is the mystery of godliness: God was manifested in the flesh, Justified in the Spirit” ( 1 Timothy 3:16). Today my Beloved, I invite you all to unite and become this burning bush. You all know that the Holy Spirit Who dwelt on the disciples who had gathered in the cenacle, receiving Him as” divided tongues, as of fire, and one sat upon each of them” ( Acts 2:3). Here, it becomes clear to us that the fire of the Holy Spirit does not stir up within a human unless He is settled and rested within. The disciples were waiting, longing, praying and anticipating the dwelling of the Holy Spirit upon and in them. And we all have believed in Jesus Christ, baptized through Him; receiving the fiery fire to stay within us…. So why are we so cold?! I would even say that we are so called living yet, are cold as the dead. And the reason is clear; we allow willingly for the earth’s waters to control our thinking and living, inside out. Didn’t Saint Paul warn us saying” Do not quench the Spirit” ( Thessalonians 5:19). Let us review our lives and precisely check for the gaps through which stinking cold water leaks, spreading inside us little by little, until we become cold as dead. It is the time to awake, to stand up and truly repent; crying out to The Lord to save us and asking Him to fill all the gaps, drying us up and restoring the fiery fire within us, the fire of Divine love through His Holy Spirit, so that the world can see this glorified scene in us, so we might become truly light for the world and the salt of the earth. When we talk about the Spirit-ignited church, we do not have a better example than the church of the Apostles. Let us trace how she was led by the Spirit. Firstly, She was a church of prayers and supplications to all believers, men and women, a church of worship and praise. She also was a church that asks for the glory of God and the salvation of all” These all continued with one accord in prayer and supplication, with the women and Mary the mother of Jesus, and with His brothers” ( Acts 1:14). We note the importance of attendance without tepidity, also the unity in spirit and love that embrace them all. When the Holy Spirit dwelt in them, He included everyone and did not exclude anyone. And here we wish if our churches were full of that unified spirit, everyone comes to be filled and get satisfied, repleting the whole world and the attracting people through our good will and the fruits of the spirit in us, joining the loyal sheepfold” When the Day of Pentecost had fully come, they were all with one accord in one place. And suddenly there came a sound from heaven, as of a rushing mighty wind, and it filled the whole house where they were sitting. Then there appeared to them divided tongues, as of fire, and one sat upon each of them. And they were all filled with the Holy Spirit and began to speak with other tongues, as the Spirit gave them utterance” ( Acts 2:1-4). Three thousand souls have joined the Lord after hearing Peter preach a short sermon. ” And the Lord added to the church daily those who were being saved” ( Acts 2:47). What else then?! They devoted themselves to the teachings of the apostles, hearing, recalling and implementing what the Holy Spirit says through the apostles. No one imposed himself on teaching to show his knowledge and one self, in contrary, everyone including the apostles were all subject to the leadership of the Spirit through the disciples of the Lord.” For it is not you who speak, but the Spirit of your Father who speaks in you” ( Matthew 10:20). What about the situation in our churches now?! Anyone who has read a few words on the Internet, establish himself as a teacher in church regardless of his life and heart which is way far from the leadership of the Spirit and the teachings of the fathers. Therefore,our preaching and talks have increased while the number of saved souls have decreased. What huge need do we have today for repentance and submission to the fiery Holy Spirit, burning our sins and washing our filth by the blood of our Lord Jesus Christ, shining inside of us light and fire, turning our church into a f iery fire, a source of light, guidance and leadership to eternal life. Eating Agape means eating together with unconditional love. Here we sigh on what happens between us because of meals, food, eating and drinking in our churches. Where is the love? Where is the giving? Where is placing the other ahead of myself? Where is humility and humbleness? Where is the last seat in service? !!!!!! Let’s review ourselves in our various services at church and seek the work of the fiery Spirit to inflame our hearts with love. As for the secret of the Eucharist, the souls that used to receive the Lord’s body and blood were souls living in repentance and confession, recognizing the greatness of this mystery as the secret of secrets” And many who had believed came confessing and telling their deeds” ( Acts 19:18). This was not just a outer appearance, but they gave up their evil actions in their repentance and confession” Also, many of those who had practiced magic brought their books together and burned them in the sight of all. And they counted up the value of them, and it totaled fifty thousand pieces of silver” ( Acts 19:19). The seriousness of the believers in the early church reproves us a lot, particularly in the way they exercised the mystery of communion. They were truthful in their repentance by word and deed. Therefore, it worked in them for the forgiveness of sins and eternal life starting here on earth till no end. If only we recognize the greatness of this mystery in our lives, receiving it with true repentance and complete submission to the Word of God, that enlightens our path. O fiery Spirit of God, enlighten our lives and churches with your divine fire, burning our impurities and sifting our lives and behavior so that we become as gold that has been refined seven times, and we become in our churches this great scene of a lighting burning bush, praising the Lord forever Amen.